We are instrumental in offering Energy Drink (Gnex) to our clients. 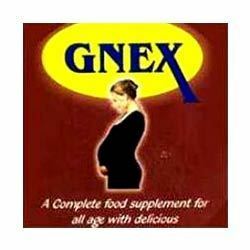 We bring Energy Drink (Gnex) for supplementing the body''s daily requirements of protein which is very essential for the pregnancy women. The drink has been introduced in chocolate taste and is quite popular with children as well as adults. It has a perfect blend of carbohydrates, vitamin B1, B2, B6, B12 and magnesium that help in proper development of bones an efficient blood circulation. Dixon Health Care Private Limited was established in 2000 in Vasai, Maharashtra. We are one of the leading Manufacturers and Exporters of premium quality protein supplemental and pharmaceutical products such as Chocolate Drink, Protein Supplemental, Protein Plus, Procure Chocolate Drink, Pro-nut Granules, Super Mass Gainer, Carbo Way Body Building, Source (Nutrition Supplement). The company has been continually working on the enrichment and efficiency of its products. Most of the products are supplied to fitness centers, health centers, hospitals, and various sports centers. Owing to our sincere efforts, we have earned a huge clientele in domestic as well as international markets. Our products are relatively safe and have no side effects. These are available at affordable prices with all the leading stores. Since our inception, we have walked with the pace of time and understood the market needs well so as to provide the relevant and high efficiency pharmaceuticals. We adopt latest technology to offer best services to our customers and add value to their needs. Our customer-centric attitude and ability of multitasking has helped us to serve the customers efficiently. Our customers belong to different business domain and thus understanding the requirement of the each, we serve them accordingly. We make sure that products are designed and developed as per the requirement of the customers & according to the market trends. We also put our consistent focus on serving the clients with superior services like timely delivery, after sales services, packaging, etc. Owing to the same, we have earned immense client appreciation and thus garner huge market success. Our customer-centric attitude and ability of multitasking has helped us to serve the customers efficiently. Our customers belong to different business domain and thus understanding the requirement of the each, we serve them accordingly. We make sure that products are designed and developed as per the requirement of the customers & according to the market trends.